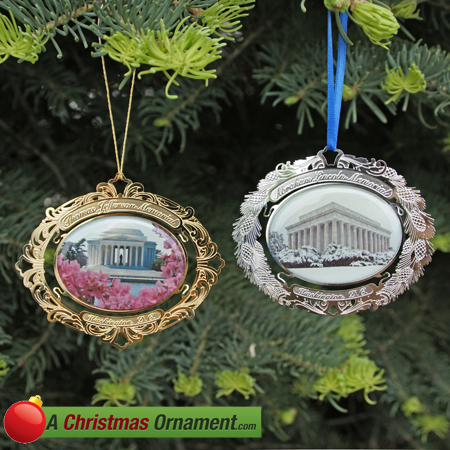 Christmas Ornaments Made in USA - 2009 Nation's Capital Ornament Gift Set - A Christmas Ornament Co.
Save over 10% when you purchase these beautiful American-made ornaments featuring two of the most beautiful and architecturally amazing Memorials in our Nation's Capitol. The massive Lincoln Memorial was completed in 1922 and is located on the National Mall in Washington, D.C. The Jefferson Memorial, a circular domed building designed after the Pantheon in Rome, remembers the contributions of Thomas Jefferson who was third president and author of the Declaration of Independence.